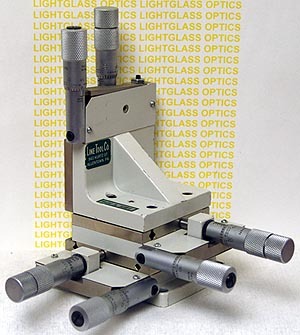 The Line Tool Co. A-RHFF 3-Axis Linear Translation Stage is very similar to the Line Tool Company A-RH model, with the addition of the dual micrometer control on each axis. Each axis runs on ball-bearings, and is very smooth in operation. Very precise control of each axis is possible with the dual micrometers. Travel in each axis is 0.50" and the actuators are included in the price.